A data loss bug that has crippled the webOS Evernote app finally has a fix available and more updates are on the way. This was sad news for Evernote fans in the webOS community since version 1.o is virtually unusable. Notes created in the webOS app would sometimes fail to sync with the server and get stuck in the pending queue forever. The only solution was to delete the note and start over again. There is also an issue where it fails to scroll all the way to the end of a note and thus some of the text cannot be seen. I could not even run Evernote on my Sprint Pre because it would cause my phone to freeze up every time I launched it, so badly that I had to take the battery out to restart it. All of this on top of many limitations in the app's feature set, such as a lack of copy and paste or full editing features available in other versions like bulleted lists. At long last, version 1.1 is available for download, though not yet in the official App Catalog. It is available via a download link posted in the Evernote forums. You will need webOS Quick Install or other installer to get it on your device.This version fixes some of the data loss bugs and 'more significant improvements' are promised in future updates. 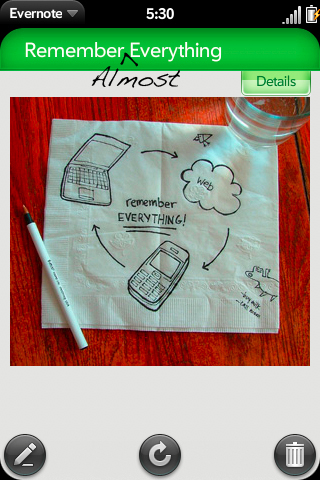 Source: Evernote User Forum; Thanks to user xImtc for the tip!